As I reflect on the successful opening night of her own things: the works of erin kendrick this past weekend, my heart is filled with gratitude, my mind is processing the intensity of the experience, and my eyes remain dazzled by the brilliant art work that fills our spaces. As the first Conversation posted about this show I could be focusing on the remarkable event that we had Saturday night and share pictures of the celebration. You could be looking at sparkly, high energy images of more than 300 people, beautiful in their diversity…images of joyful conversations, amazing art, and the offering up of love to Erin Kendrick on her big night. To say Yellow House was lit would be a wild understatement. Instead I share one of the final moments of the week-long installation that was marked by hard work, many generous hands, and intense creativity. This was not the kind of installation that entails a bit of patching and painting to make way for a group of paintings to be hung. This is the first time Yellow House has shown a single artist and literally turned over the walls, floors, and windows to amplify one artist’s lived experiences. It is an installation anchored by 7 large paintings, and includes domestic furnishings, drawings on walls, poetry in every room, and eggshells…hundreds of them. It is also a show that was still being curated as we shared the space together, ensuring a seamless merging of space, message, and art. So, as we entered the final hour of installation before we had to ready ourselves and our golden abode for opening night there was one more creative act to take place. 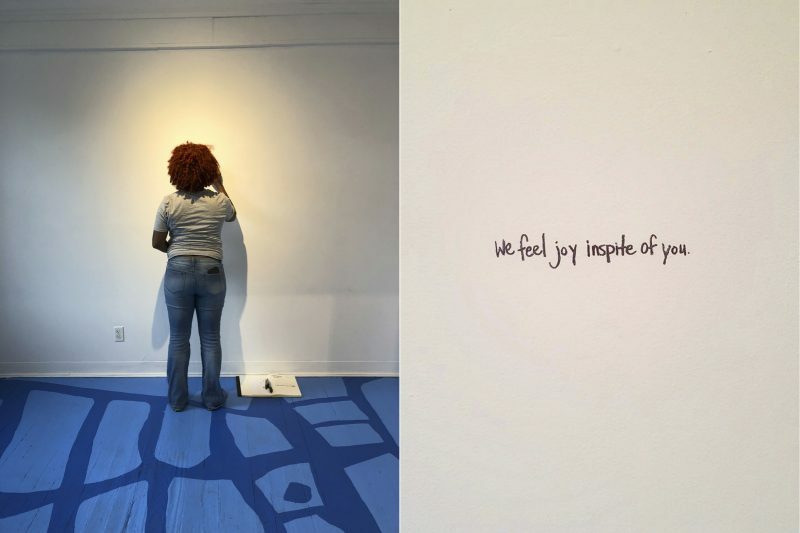 In the intimate ‘porch gallery’ under the gaze of lady in red, right past the portrait of lady in green, and next Ntozake Shange’s poem ‘i usedta live in the world’ Erin quietly stepped forward and wrote her own words, intimately scaled to beckon us all forward…WE FEEL JOY IN SPITE OF YOU. Kendrick’s voice, her journey, and the stories of black women are what we all need to hear right now. I am grateful to Erin for sharing her truth with all us so courageously. It has been a privilege to share space with her, to work alongside her, and to learn from her. The art and Erin as a human being have moved me more deeply than I can express. And this is only the beginning. I hope you will join us during the run of this important exhibition. Keep checking the bottom of our website home page for the latest House Hours and we will be adding public programs to the mix, too.